Moles are one of the most common and most frustrating lawn and garden pest problems. With that in mind, take the time to visit the website of our local mole expert, Mr. Tom Schmidt [www.themoleman.com] before deciding what your game plan will be for the current mole(s) in your yard. You may choose to live with them or try your hand at removing them from your garden. Forget the poison peanuts, the gopher gassers, the Juicy Fruit Gum, and all the other home remedies. 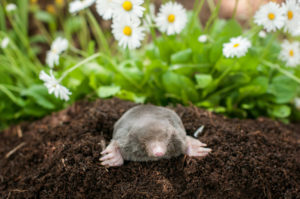 The only sure cure way to get rid of the current mole invasion in your yard is to either trap the moles (using one or several of the many types of mole traps – scissor, harpoon, choker) or physically remove them by digging them out of their runs. Spring and fall are the best times to trap, although it can be done anytime. But these means of control are the ONLY sure cures for the current moles in your yard. We say “current” as new moles may move in after the old mole’s scents wear off! There is an injectible / ingestible poison available, Moletox Baited Gel, which is injected into the active runs. It is safe to use if you have cats or dogs. Again, results may vary greatly. The new one is Talpirid, but again, it must be placed in active runs and results will vary. Trapping or physical removal are still the only sure cures for the existing moles in your yard.